This entry was posted in Happiness, Race Reports, Running and tagged charity, Race Report, Running by txa1265. Bookmark the permalink. Congrats on a great PR and a getting that 5K in. Congrats on your HUGE PR!! & kudos to Wegmans for funding everything so all the money raised went straight to charity 🙂 loved the elf ears & bracelet as well. I agree – and having volunteered at the food bank, we knew how much good this money will do in the area, making it even more important! I couldn’t even believe it when I saw that you posted that you ran a 5k! (I haven’t been on instagram all day so this is the first I saw of it). That is so amazing, congrats! I have a feeling you will be more likely to do another 5k now…maybe?!? Maybe 🙂 Seriously – it was great being out, seeing people and so on, and obviously I am happy with my performance. But in the time from when I left the house until I got home I could have run one of my 15 – 20 milers around my area … so I don’t know 😉 But it is good that a 5K has much less of an impact on life than a half or full marathon. NICE JOB! And in a most elf-cellent hat, by the way! I need to find a way to do speed here without feeling like I’m going to die on ice… Or 15 mph headwinds, as is more typical. We definitely lucked out on both counts – we were at 10F Friday morning, and had 15+MPH winds today for my runs … but yesterday there were only light winds and the temperature stayed at 36 – and it even stopped raining (mostly) for the race! Thanks again! That’s an amazing PR! Congrats! Also that was some great race swag- liked the socks! I’m kind of impressed that the elf ears stayed on at that pace! :). Thanks Fallon! I loved all the cool swag – and I was surprised that the hat stayed, but I have a big melon of a head so it was very tight fitting. 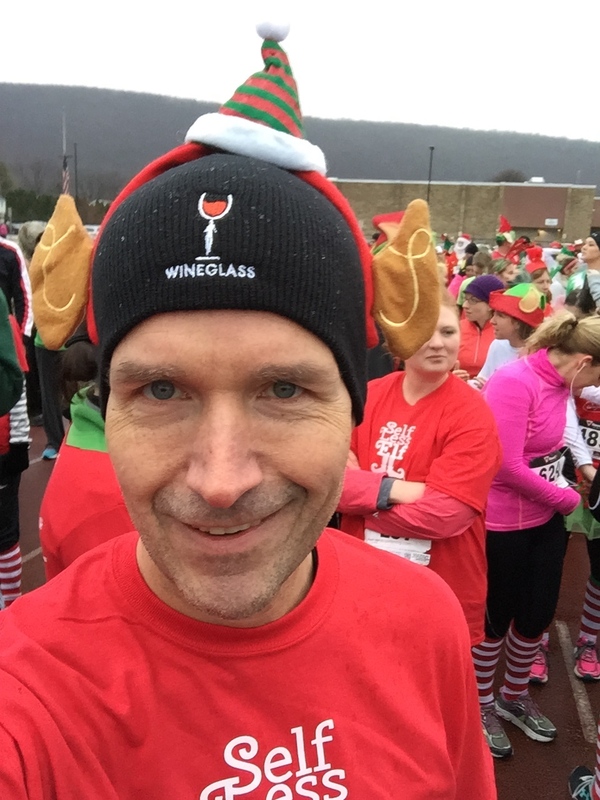 Speaking of swag – the Wineglass people were giving out those hats for free also! Bonus! Wow, congrats on an awesome race! I have not done a 5k in forever either, it just never seems like the right time. 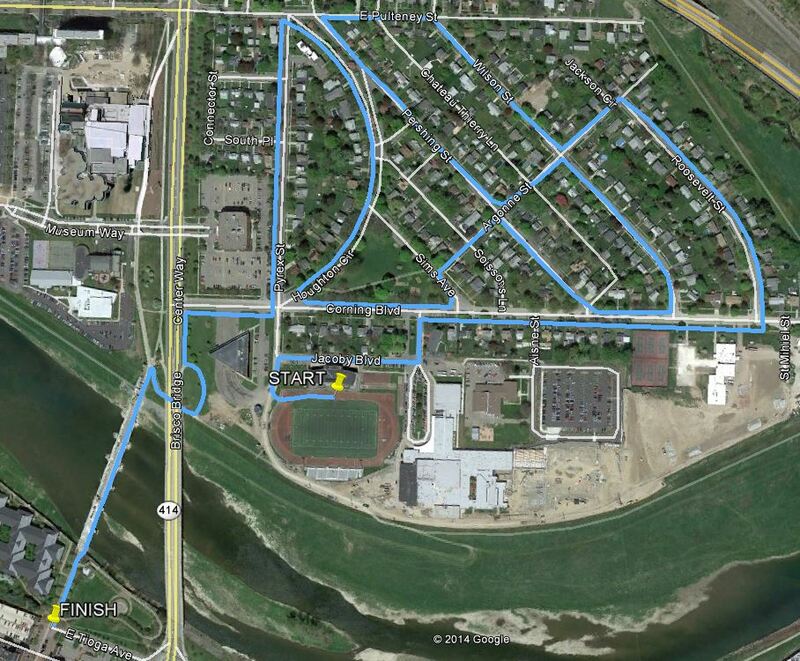 With all the miles you run you have built quite the aerobic machinery to crush pretty much any distance I would think! haha – even with the rain it was the best day pretty much all week 😉 Thanks again! You should absolutely be super proud of yourself for this! Congratulations. I also have a fear of the 5K. My competitive side always comes out and I basically sprint. I’m a distance runner, not a sprinter so it never ends pretty. This race sounds like such a fun one and I love that everything went to charity. I love the holiday season so much because of all of the charitable giving. 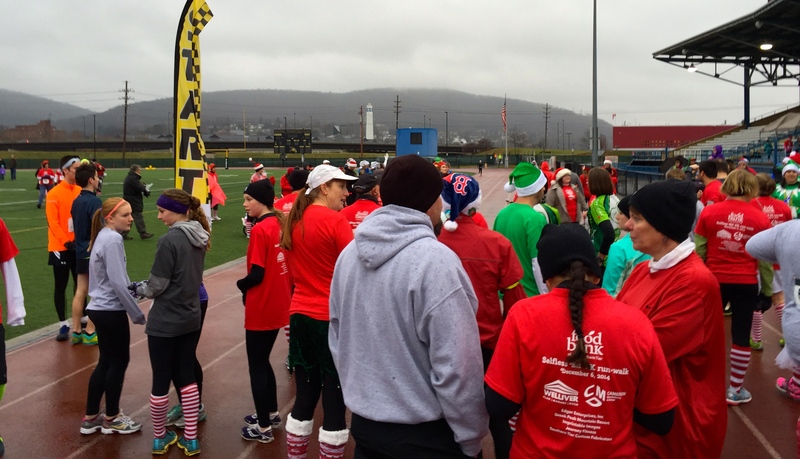 What a great way to combine all of the holiday greatness and a run in one. A huge congrats! haha – in reality it wasn’t too confusing, but that was at least in part thanks to the great volunteers! And Thanks! Nice job on such a solid race and your socks are the best. I know – don’t I look awesome 🙂 Thanks for the support! So proud of you! awesome!! Just a smart, well-executed, very well-deserved race!! As you said on Instagram #IToldYouSo 🙂 haha Thanks again for all of your support! That is absolutely awesome!! Congratulations on an epic PR in an epic costume. Also, makes me laugh every time that I see you live in Horseheads since my uncle lives there and that is just so freaking random. Thanks Danielle! I loved dressing like that – it was fun! CONGRATS!! I am so freaking proud of you, you totally KILLED it! That is an incredible PR and very well deserved!! Your outfit was awesome too, I could have used those socks this weekend, it would have added a bit more festivity to my race outfit, although I did have a red shirt on under my jacket!! 🙂 Congrats again!!! Congrats! 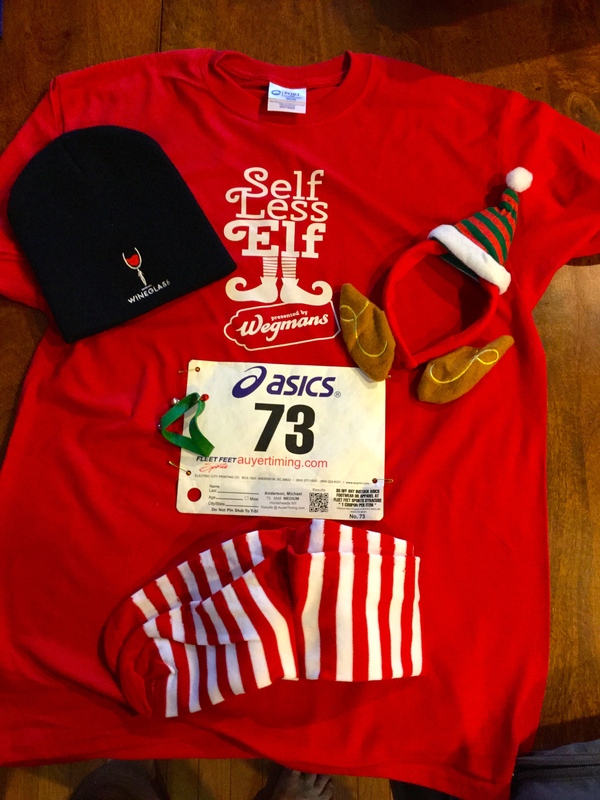 Your post highlights two of my favorite things about races — supporting a good cause with others in the running community, and getting a measure of your current ability. And of coure having a massive PR is also a massive highlight! Nice job! Thanks Carina! I certainly surprised myself – especially since I looked at the crappy weather and other things I wanted to get done and almost skipped the race, since giving the money was most important. Glad I didn’t – getting a huge PR like that made it worthwhile! I’d be a pretty poor friend if I couldn’t celebrate your accomplishments even through my own disappointment! 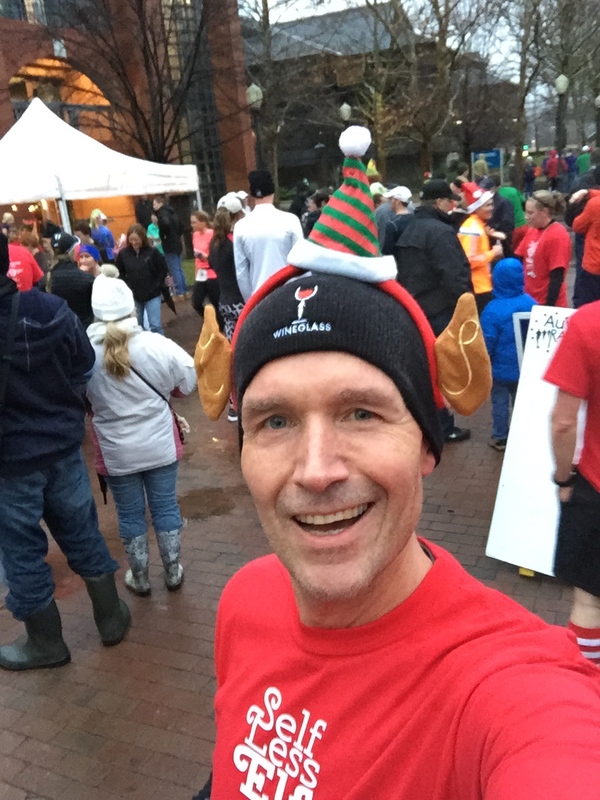 Thanks so much – and you can be sure that hat will get worn again with upcoming holiday events at work! Woot woot!! Congrats Mike!! That’s awesome 🙂 I love surprises like this on race day…shows what happens when you work hard but go in to have fun/see what you can do! Thanks Caitlyn! It was a great surprise.